We’ve been meaning to share with you a pretty special job we had the honor to complete here in our shop last year. 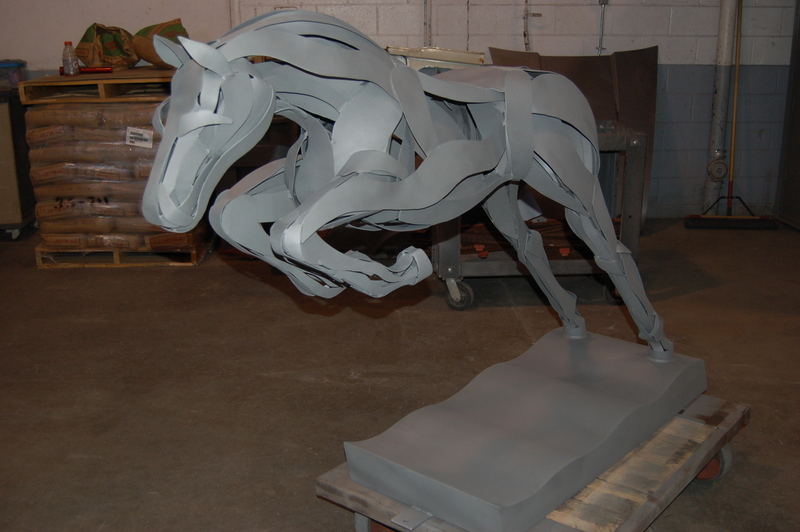 Back in February, we heard about the passing of award-winning equine metal sculptor Marcia Spivak. Spivak works on “Qianli Ma,” a commission she completed before her death. Photo Courtesy of WAG Magazine. Ms. Spivak lived in Wilton, Conn., but her work lived all over the world. Shortly before her unexpected passing last year, she completed a 8×10-foot commission called “Qianli Ma” for Aria Resort & Casino in Las Vegas to celebrate the Chinese Year of the Horse. In our shop, we got the privilege of blasting a smaller, but equally impressive work. 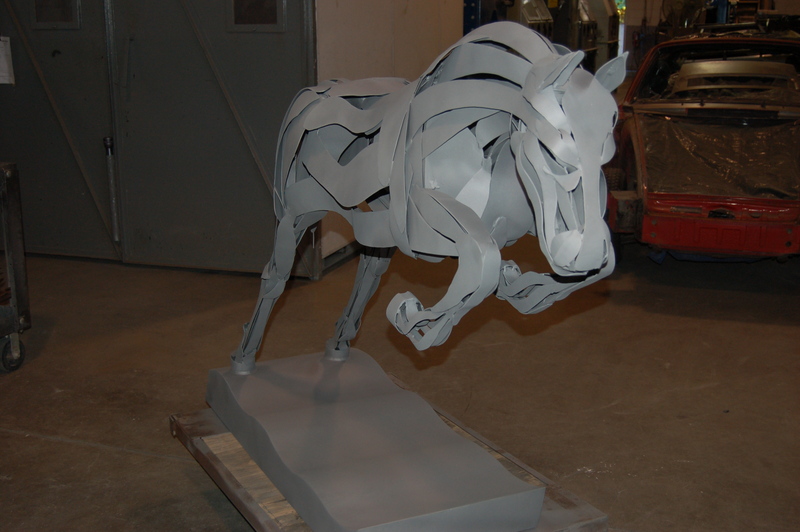 The sculpture was crafted in steel and had been displayed outdoors. The metal had oxidized considerably over time. The owners wanted to clean and prep the surface for a new, more appropriate outdoor coating. We partnered with our good friends at Composition Materials to use the right bead blasting materials. Even though steel is strong, you can see that the metal had suffered and been weakened by the elements. Our guys worked carefully to ensure just the right pressure and angle of blast. Spivak studied originally at the University of Wisconsin, Madison and always loved horses. She started riding when she was 6. She moved to the East Coast in her 20s and fell in the love with the beautiful Wilton area. It was there she started sculpting with metal, studying under David Boyajian at the Sculpture Barn. She sculpted for 16 years, selling almost all of her work, pieces from tabletop size, to larger than life. She did all of the welding herself, often building the piece from scrap materials she reclaimed from other artists or found in junk yards. We were sorry to hear of the loss of Marcia Spivak, a great metal artist, and grateful to have been able to help restore some of her artwork.